I just sent my final email as a tentacle of the Squid to the community in which I've been able to start my life as an entrepreneur. Giant Thinkwell has been one of the biggest puzzle pieces of my life and it's been an incredible ride with a handful of really fun stories created along the way. 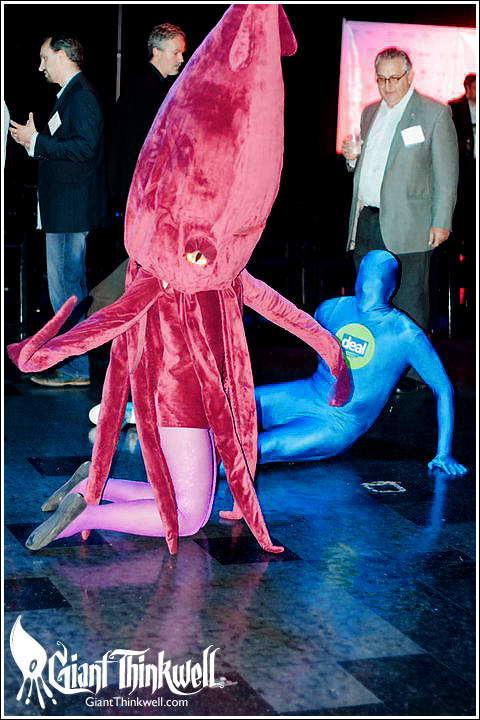 Some of my favorites are the scantily clad Seattle Met recap, being voted Seattle's Best Startup Designer over the people I look up to, the larger than life War Rooms and getting to do a commercial with Sir Mix-A-Lot… oh right, can't forget about the stairway battles! I have felt fortunate every single day to be a part of the Founders/TechStars family in Seattle and have enjoyed learning, growing, creating and being inspired in a way that I have never experienced before. That community is truly unique and special and I hope to find other ways to be a part of it. If I could leave behind two things from this experience, they would be that you should be proactive in creating an environment and culture in which you thrive, and also the importance and value of brand, design and storytelling. I would argue that it is equally as important as a technology that functions, sometimes more valuable if you want to test assertions or even raise money without having the fully functioning technology, traction or data points. What does leaving Giant Thinkwell mean for you and me? I'm not sure if you've ever seen Lost, but in that show, there is a electromagnetic anomaly that builds up and must be released every 108 minutes or the entire world ends. That electromagnetic anomoly they are referring to is actually the creative energy that runs through my veins. I need to find projects to apply it to, so please, for the sake of all that exists, reach out and let me know what you're working on and where I can make it fun, colorful and loud! So much to learn from this experience and bring to bigger and better things! I recently picked up a Wacom Cintiq 21UX, which came just in time to crank out a handful of assets for Giant Thinkwell's latest game with Sir Mix-A-Lot. It consisted of about 4 dozen topical rounds where you get a chance to get to know Sir Mix-A-Lot and your friends a little bit better. The content was hilarious and needed a suitable visual to capture each round. I've used a Cintiq a bit in the past, but having this tool has easily increased my productivity by a good 300%, not to mention is faaarrr more enjoyable and awesome than even a normal Wacom Intuos tablet. If you are a digital artist or run a shop of creatives, do yourselves all a favor and invest. The productivity, quality and quality of life is worth a few extra pennies. 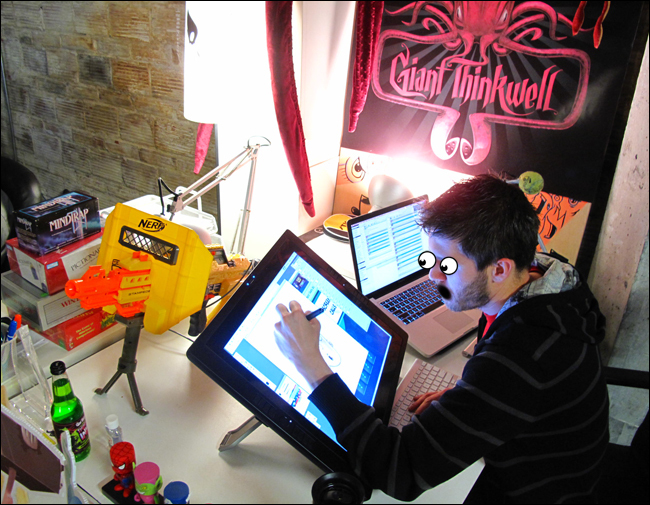 I've been keeping my head down pretty rigorously at Giant Thinkwell, so much awesome going on! We released a new game with Sir Mix-A-Lot, got an absurd amount of great press, released a few more features and now are on to our next adventure... stay tuned for that. In the meantime, check this short video I shot with Mix! It was the 2010 Seattle 2.0 Awards and I was running around with Kevin Leneway and our baby Uncle Jesse on my iPad, still fresh to the Startup world just a few weeks after Startup Weekend. When we sat down for the ceremony, I listened in awe as Jonathan Sposato gave an incredible speech, followed by hearing nominees and names of people and companies I had never heard of before. Kevin was sitting next to me, pointing out each person, giving me a nutshell overview as he called out his speculation for who was taking home which award.. he only missed one! About half way through, the nominees for Best Startup Designer were read, and I instantly thought to myself, "holy s*#@, an awards show where Designers are recognized??" Before Jenny Lam's name was read to be the winner, I had a split second fantasy of my name being called and accepting the award. It was a silly fantasy that didn't last long for a few reasons. One, nobody knew who I was or had seen my work. Two, I wasn't a nominee and lastly, I fancied myself more of an Illustrator than a Designer. The night went on and I met a ton of great people that had all this buzz and excitement about them with being a part of this community. It was at last year's event that Kevin and I spoke to Greg Gottesman of Madrona Venture Group and Andy Sack of the upcoming Seattle TechStars program and they convinced us to apply. Over the course of this last year, I got to collaborate and brand a number of organizations for Seattle's community, including Tech Cafe, Seattle TNT, Startup Weekend, a handful of TechStars teams, Brad Feld, Untitled Startup (now Simply Measured), DotORG, Geekwire and a few others.. it was with these projects that people got to know who I was and were excited to help me in my endeavors with Giant Thinkwell. 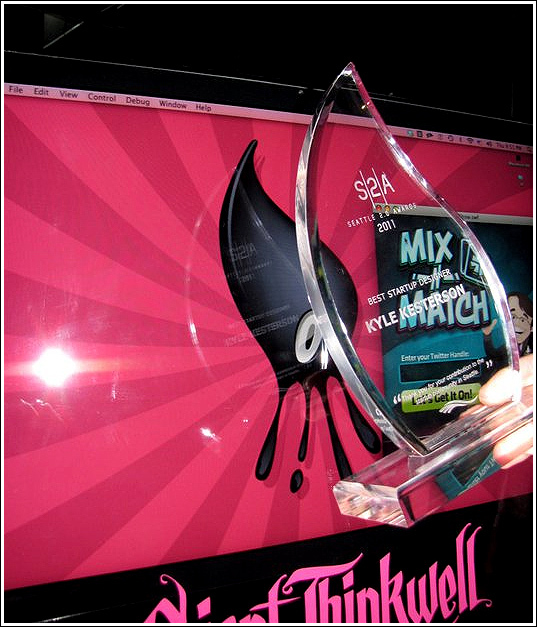 Fast forward to a month ago or so when nominations were open for Best Startup Designer 2011. My Co-Founders, being some of my biggest supporters, spread the word and tried to get me voted in. Shortly after nominations closed, the 5 selected nominees were named and I was blown away that I was amongst the other 4! Matt Shobe, Tony Wright, Aviel Ginzburg and Jay Dokken are super heavyweight hitters with the Designer's label and it felt really great to even be considered in the bunch. 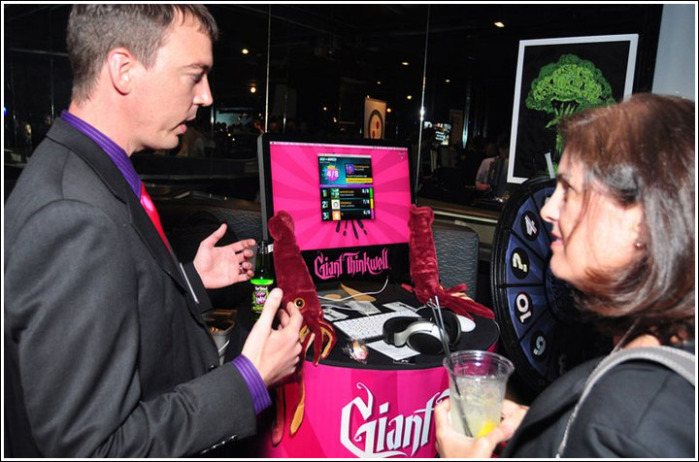 From knowing these guys, I quickly conceded and just looked forward to the event, especially because Giant Thinkwell was given a table to present our demo for our upcoming game, Mix 'n Match. Kevin and I worked around the clock, cranking out a game that only existed on paper, as well as all of the design and production for the physical booth. I don't know if you've ever seen an installation or booth from me before, but it'll never just be a table and computer or white tent. I find myself obsessing over the tiniest details and cram in as much as humanly possible to create the best experience I can. This time it included a fully animated game, banners, a Wheel-of-Awesome where winners got to spin for extra swag, including plush squids, squid neck-ties, toys I made at Funko, silkscreened posters, art prints, cut vinyl decals of our new brand and "Think Ink - Squid brain juice". 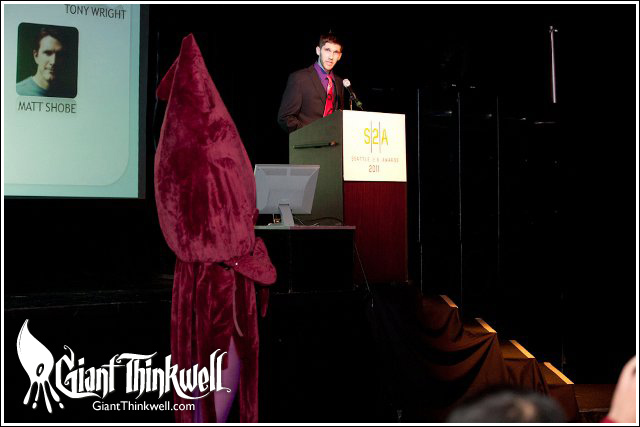 I branded my iMac, decked the crew out w/ custom ties and to top it all off, Colleen, the girlfriend of our newest hire Kav brainstormed with me and built an 8 foot squid mascot of the Giant Thinkwell squid! The game got finished at 4:30pm, then we drove down to the space to set up at 5pm. The squid was getting the final hot glued pieces done in the back and I hadn't seen it since it was in armature phase.. When it came time for Danielle Morill of Twilio to present Best Startup Designer, she gave a fantastic and vital speech on the value of design in startups, which is only now starting to become a widely accepted practice amongst developers and business founders. She was opening the envelope and as my girlfriend Danielle was gripping my arm and then I heard it. It was this eery echoing call - "Kyle Kesterson!" ... My brain went cold and my eyes grew wide. I thought to myself, "ooooh man, I wish I planned on something to say..." It was a looong walk up to the front but nothing was coming to mind! I get about 2/3 the way up and I see thse creepy yellow glowing eyes start to sway to the front of the room. It was the squid! It was such an overwhelming moment trying to grasp that not only had I somehow achieved what I fantasized about a year earlier, but how every single piece of the puzzle all came together the second that I had seen the glowing eyes. 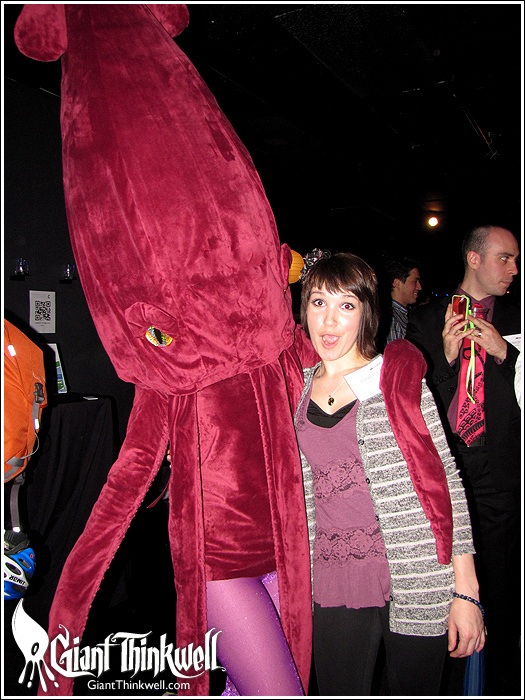 I burst out and ran up to hug the squid! That was a moment of completeness. If you were to ask me after the acceptance what I had said, I couldn't tell you. I was numb. I remember walking on stage and hearing a faint whisper of my voice echoing into a sea of dimly lit faces. Videos of the speeches were posted the next day, so I got to go back and relive it and see just what DID come out of my mouth. I'm glad I managed to capture my gratitude to the startup community, Startup Weekend, TechStars and definitely the support of my lady, Danielle, but I completely blanked on a few very important people. I really want to say that meeting Kevin Leneway has changed my life. He is one of the most brilliant, talented and genuine people I've ever met and I'm so blessed to be working by his side every day. Adam Tratt has also an incredible friend, supporter and balance to my creative craziness. Without those two, Giant Thinkwell would not exist today. Donald DeSantis, one of my best friends, introduced .. no, dragged me kicking and screaming to Startup Weekend, dragged me from Kirkland to Greenlake to move and delivered my ransom notes to Andy Sack to get into TechStars. He is extremely perserverant, influential and obsessed with getting better.. I'm stoked that he is now working full time at Giant Thinkwell. Marcelo Calbucci, Andy Sack, all the TechStars teams, Greg Gottesman, Scott Jacobson, Mike Folden, Adam Doppelt and the other Spoons, Jason Hills and so many others! Also The Root 42 has been a decade of growth and without that community, would probably not be making stuff, let alone doing it for a living. Lastly, I have gotten incalcuable love, support and inspiration from my parents, Steve and Tamera. My mother's story is one that'll leave you in tears, followed by inspiration to take ANY leap. My dad's work ethic, dependability and kind heart is of an era that many of us can learn from. I love my parents more than anything and I most definitely would not be doing at all what I am doing or be who I am if they hadn't taken the incredible risks they took to get my brother and I out of our old lives. I feel overwhelmed with the blessings that I have received and aim to be a part of paying it forward. Thanks everyone! Xconomy: "Striptease Threats, Aggressive Shushing, Mascot Mania: Memorable Moments from from Seattle 2.0 Awards"
GeekWire: "A night at the Seattle 2.0 Awards: Watch the speeches of the 10 winners"
Really fun article written by James Ross Gardner about Giant Thinkwell in March's edition of the Seattle Met. 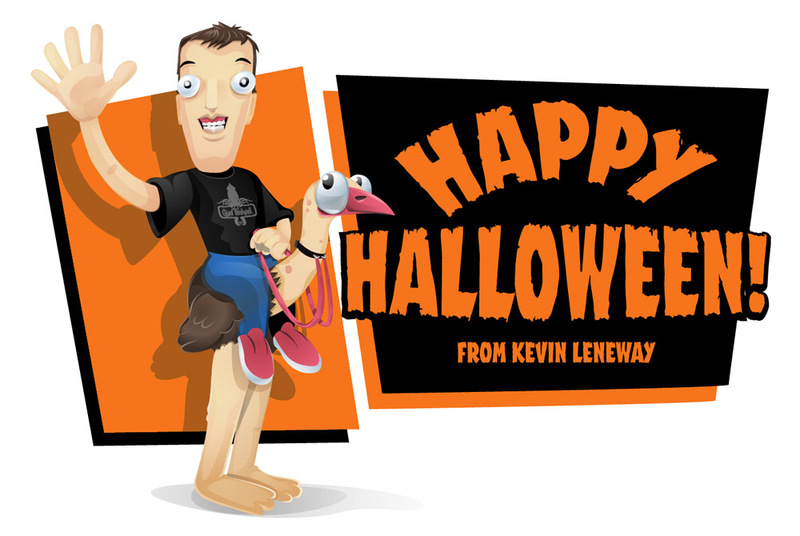 Did an illustration for Kevin Leneway, co-founder of Giant Thinkwell in his inflatable ostrich costume. It was so funny watching him ride that thing all night long!